Let’s not forget that there was a mention of turning the vehicle off while coasting, which will cause things such as power brakes and power steering to no longer function. In my eyes, this will lead to more accidents because of people’s unfamiliarity with their car’s behavior without those two “luxuries”. Forced stop or key-off and coasting is EXTREMELY dangerous. You have no power ot manuver out of a situation should it develop – no vacum to run your power brakes, and no power to run your power steering. It’s just down right DANGEROUS! Not to mention mechanically costly. Smooth driving and proper maintenance is the best. Not to mention the several hundred cranking amps you pulling out of your battery every time you start it. Good points. Thanks. Good post! The math in that article was also hopelessly flawed – I don’t know if it was the fault of the reporter or the person being interviewed, but miles per gallon per person is exactly the WRONG measure to use. What you want are person miles per gallon. More people in a single car is a good thing. Your effective gas mileage should become larger, not smaller when you add people. You should multiply your mileage by the number of people to get your effective mileage. The article is also flawed in that it assumes the only goal is reducing a carbon footprint by using fewer gallons of gas. Well, it takes an awful lot of gallons of gas (or equivalent energy) to produce a new set of tires. If reducing your carbon footprint is your main goal (one I think is rather foolish, by the way), nothing will compare with carpooling to work or taking public transportation. They are a lot safer and more effective than the dubious ideas in this article. this is what happens when idiots with ideas are alowed to spew their ideas on the news. Lets ask what kind of automotive engineering degree Mr. Gerdes has before we accept his idiocyncratic ways. Another pitfall to hypermiling is that other drivers around me are showing signs of Road Rage. I’ve been utilizing some of the hypermiling techniques and I’ve been getting more Road Raged people giving me the universal “You’re number 1” hand gesture. Since not many people practice the hypermiling methods, I’m sure the road rage is inevitable. I will admit that by using some of the hypermiling techniques, I’ve been able to get my 97 honda accord to 30 mpg (versus the 23 mpg I would get if I drive “normally”). I can see where the Nuclear Engineer’s idea of carbon efficiency of a jumbo jet vs. a full Prius could make the two comparable, but it’s entirely theorteical. AutEes know the opportunity cost of driving a packed prius 3000 mi. is enormus versus taking a jet that will fly and use fuel regardless of your presesnce. Even if the plane is not full you still win out; take the money earn from the 4 working days you save by flying and apply it entirely to other carbon-friendly upgrades/investments. They also forgot to add how much the extra weight of 3 more people (and their luggage) in your car will affect your mileage. It still comes out as a net gain but it’s not as clear cut as they made it. As for Cruise Control being a sure way to better fuel economy, that has a qualifier as well. The steady throttle on a flat road is great but when you hit a hill the CC will hit the gas and down shift (with an auto) to keep your speed constant. This is a sure fire way to waste fuel. If there are hills and grades on your road turn the CC off and try to keep a steady throttle. This means you will slow down on uphill sections and speed up on downhill making the best use of gravity and minimizing its detriments. When I turn off my motor and the wheel is turned, the wheel locks. Im reasonably sure that is not safe if your coasting down the highway if you have to change lanes or go around a bend and the wheel locks. A few notes on the tire pressure. Keep it up 2-5 psi from recommended, but remember that when turning your car will feel “loose” (overteer). Also, more passengers/load = higher tire pressure (durability + fuel saves). More on the latter, including speed effect, in SAE J2452. Air resistance is a big factor, something everyone on this forum shies away. Don’t tailgate, maintain 2 lead-vehicle lengths at 70 mph and you’re OK. Watch out for debris. Aerodynamic losses depend, at these speeds, on speed^2 (Cx on a modern pass. car is about .3, about 0.6 for a Hummer, about 1 for a flat plate). Do the math. Another thing , drive smoothly – less gas and less brake will not only extend your MPG but also your vehicle life. I recently sold my 98 accord I4, auto, it took 31 MPG on mixed 60-40 HWY-city, or over 4 MPG on the EPA estimate. I now got a new Altima I4 with a CVT, it takes about 31 MPG on the same regime, or 3 MPG **under** its EPA. Go figure. Apparently, Honda underestimates the mileage, while Nissan overstates it. I’ll have to check to see if the EPA cycle changed since 98, but think no. I’m still happy, because others are happy when they break the 20 MPG mark. The tires wear out on the edges before the middle. That’s a clear sign of underinflation. Higher pressure also increases wet weather traction – reduces the risk of hydroplaning. That’s what the linked Tirerack article actually says. Also, a major factor in the whole Explorer / Firestone blowout problem was the LOW recommended tire pressure. Higher pressure actually reduces the risk of blowouts by reducing the amount of flexing the sidewall experiences. Wayne has *averaged* 48.5 mpg over the 100,000 miles on his car. That’s approximately 2,000 gallons saved compared to the car’s 24mpg combined rating, or about $8,000 at today’s prices. That’s not pocket change. Even using the basic techniques on CleanMPG, you can get 25% better mileage easily. I use the more advanced techniques, and I average 60 mpg in my Civic – epa rated 35. Turning the key back ONE click will not lock the steering. That’s 2 clicks back. As soon as the engine is off, you turn it back to the ON position. 5w20 oil is specified for most new Hondas, Fords, GM vehicles, and Toyotas. They’ve done their homework. I’ll trust them. *disclosure: I personally know Wayne, and I’m an active member at CleanMPG. You know, when you turn that engine off on most automatics and stick that car into neutral that’s TECHNICALLY equivalent to flat towing a car. Most vehicals with automatic transmissions cant be flat towed because the oil pump in the transmission isnt doing anything.. Thus you get no lubrication to the gears and bearings. Turning off your engine turns off that oil pump inside the transmission. Good job Mr. Nuclear Engineer, you’re burning up your transmission. All that money saved will come right back in your face when you’re paying $2000+ to have that transmission replaced. On the flip side, most vehicals with MANUAL gearboxes can be operated safely like this, and if you have a 4×4 you can stick the transfer case into Neutral and be okay.. Though older 4×4’s can’t do this on the fly. So, seriously. Somebody tell this guy to stop advertising this bull around because people are just going to destroy their cars faster and, in the long run, spend even MORE fuel replacing parts and fixing everything. True and a very good point. Some automatics are ok with then engine off, some are not. The 2005 Accord is one that IS ok with it. This article compared consumption between a car trip and a plane trip between the coasts. It failed to mention one may take around 4 hours, while the other could take three days. If we are talking about cost, that is a huge cost, probably a lot more than these minor differences in consumption. I also disagree with Mr. Gerdes, and cleanmpg.com (whose website doesn’t seem to work, maybe they don’t take questions) and these lame-brain methods of saving a few bucks. When Mr. Burnt-Up-Starter-Motor takes to the streets, get away from this clown-driver as quick as you can!. People employing these less than recommended ‘gas saving tips’ should be required to have their cars painted in day-glow pink paint, with a high powered strobe light system that warns the rest of us where they are! On top of that, Mr. Gerdes, Miles O’Brien, and cleanmpg.com, you should know that in California, ‘coasting’ in neutral is against the law. Great story, Miles. Could you please find someone credible in the future? The oddest thing about the article is the fact that he drives an automatic. Manual transmissions are significantly more fuel efficient. In my poor opinion the real way of reducing the consumption is having just the sufficient engine and weight. I think that most of the cars have an oversized engine that give him bigger strong than they really need. And to get it the problem is the overweight and the over-engime. My car with only 750kg, 699cc and 105hp is a real fuel saver and SUV killer..
Make the cars the most light and small possible, and we get less consume and less costs. It is the easiest and cheapest way. I disagree with Patrick’s main point–some hypermiling techniques like smoother driving are actually safer than hot-rod starts and quick stops. However, he is correct about coasting–it is illegal in many places. As others have pointed out, it is extremely dangerous. I have also heard (though not confirmed) that shutting your car off *anywhere* on a public street in a lane of travel is illegal. My dad used to shut off the car at RR x-ings, and I still do that when not driving my Prius, but passengers have told me that it is illegal. I guess the problem is that, if your car doesn’t start back up (poor battery, vapor lock, etc. ), you create a major hassle for everyone else on the road. I agree with most of the posters here–smooth driving is the way to go. You don’t have to accelerate painfully slowly, but if you accelerate a little slower than many people do, it saves a lot of gas…and you get to your destination in about exactly the same amount of time. I also use my cruise control for about 80 % of my driving. The CC on the Prius is well designed, and makes it easy to make occasional small adjustments to match my speed to that of traffic. As someone else pointed out, using it on hills is wasteful, but holding constant throttle on hills is dangerous as well, since it causes your speed to fluctuate wildly on hills. There is a happy medium to be had, between constant speed and constant throttle. One more final point…since I’ve had a car on which I can track my instantaneous and 5-minute average mileage, I’ve become very sensitive to the effect of stop-and-start driving. I wonder if cities are aware of how much pollution they are personally responsible for by not optimizing their traffic light system. When I drive across town on surface roads, I find myself getting stopped by about 90 % of the traffic lights I encounter, even on major arteries. There is no reason for that–simply timing lights and using a well-designed combination of sensors and timers would significantly improve that. This is a big deal, considering that I estimate I use something like 50 % of my fuel starting up from traffic lights. It is not true that higher tire pressures give better wet traction than recommended pressures. It is true that low pressures give less traction, than recommended tire pressures. Reread the tirerack.com tech article The Explorer issues were a one time deal, and normally were only problems for people who set their tires at recommended pressures(that were probably a little low) and then never checked them again, or those who overloaded their Explorer and then drove 80 MPH. Higher than recommended pressures do decrease dry traction, especially in turns. What happens is that when you hit a little bump, the tire can not slightly compress to take the shock so it actually slightly bounces off the road and loses contact for a split second. This overall effect is very dangerous especially for those who now want to corner at break neck speeds so they do not need to re-accelerate. I too have started to semi-hypermile. I have just accelerated a little slower, and extended my commute 1/2 mile to keep from having to accelerate up a steep hill from a stop sign to 45mpg. I also now go 62 not 65 on the highway, drive all speed limits in town except 40, because my car shifts into OD at 43 and my rpm drops 500 at that point, so I go 44 in a 40. My 03 Pontiac Grand Prix with a 3800cc engine is giving me 26 average mpg with 75% of my driving at highway speeds. I run synthetic 5w-30 (recommended oil), performance tires(actually hurts my mpg), performance exhaust but keep no extra weight in my car. While increasing tire pressures may result in tiny increases in fuel economy, keep in mind that maintaining any pressure differential from front to rear that the vehicle’s manufacturer reccomends is critical to it’s safe, and stable operation. Some of the technologies, particularly stop start, are so obvious and so simple to implement that it seems criminal not to require them _immediately_ on all new cars. Another simple thing to do would be to require the prominent placement of a fuel-economy gauge in the instrument cluster, showing both instantaneous and average fuel-economy. I and others I’ve talked with about this find it irresistable to try to ‘game’ fuel economy when such a gauge is present. I think I read that Nissan now includes these in all its models, and some studies suggest up to a 10% increase in efficiency when these devices are present. The bottom line is that there are HUGE inefficiencies in ALL of our energy consuming systems that could be mitigated very easily with absolutely no change in our standard of living. Failure to require implementation of these simple solutions while at the same time fretting about increasing production of hydrocarbons seems just insane. Turning off the engine while its rolling might send unburned fuel into the Catalytic converter, which isn’t good on the converter. Turning corners at full speed, no braking isn’t good on the tires. Wear and tear on the ignition switch can get costly to repair. Of course, if you leave the engine off, and just PUSH your car everywhere, you are bound to get even better gas milage…. I don’t know what’s worse, people with half baked ideas getting attention or that we have a special name for the collection of them. Wonder how much the alternator drag affects MPG having to recharge the battery throughout the entire trip. Keep your car well maintained, proper air pressure in tires (not over inflated) and drive smoothly whenever possible. I agree with trying to save gas, to a point. 1) Pushing the vehicle to a rolling start on a regular basis sounds inherently dangerous……..gotta get it rolling, hop in the car, get it started, slam it into Drive, and off ya go……..but what if you slip……or trip……….or your shoe comes off……..or someone backs out of their driveway into your path? 2) Coasting along with the car shut off is REALLY stupid, folks……..the brake and steering power-assist isn’t functioning, so you’re relying on the backup manual system on both, which have very high effort and were designed to run with power assist. Have you ever tried to STOP your car from 55mph without power-assist??? It’ll take everything you’ve got, both feet on the brake pedal, and the stopping distance is horrendous. I’d hate to see Wayne careening around a corner at 2x the speed a normal person would take the same curve (because he’s avoiding hitting the brakes), with the car shut off (to save gas), and have a child run out in front of him. 3) The in-car video of Wayne starting the car while rolling and slamming it into drive immediately made me shudder…….. It’s well known that a dramatic portion of engine wear is caused during startup………because it takes a moment to get lubrication through the motor and to all the moving parts. I’m sure his transmission, starter, etc really appreciate the extra abuse. 4) Running your tire PSI above what the CAR manufacturer recommends can adversely affect handling, braking, and vehicle stability……..I tried it last week on one of my cars, and with the tires at max spec of 44 (per the sidewall) versus the vehicle recommended 36psi, the car handled horribly. Don’t forget that many states outlaw coasting a vehicle out of gear. I believe that would also apply to having the engine shut off. Not much monetary savings there when you count the cost of the ticket and having to drive to the court house to pay it. I agree with the comment about the extra wear on the starter when you have to restart the vehicle at each stop light. Wouldn’t it be fun to have to call a tow truck to haul you out of the traffic lane because you wanted to save a few bucks and your starter just gave up. Power drain on start up is also high. Try running your blower fan, radio, and countless other accessories and see how fast they drain a battery, especially at Arctic temps. For me, I’ll keep the heat on. Using “modified” techniques….no quick starts, smooth stops, overinflating the tires slightly and SLOWING down I have gotten my 2006 Kia from 31 mpg to a hair over 40 mpg. And as far as a road raging FSP…I never liked them anyway. I could care less if they flip me off. Ok…so I’m going to just say that people are going to do what they have to in order to absorb the increased fuel prices into their budget. If someone is stuck with a guzzler SUV and can’t sell/trade it for a nice hybrid, then they may be forced to do what they can. If I’m on a road in the country (with hardly any traffic) and coast a lot with the engine off, who cares? Basically, if you drive like an idiot, have tickets and wrecks that are your fault, this is not for you because obviously your judgment is impaired. However, if you have no tickets within the last 5+ years (13 for me), no accidents your fault in the last 5+ years (12 for me), and you aren’t a total idiot, you’re probably not going to cause any issues. Anyway, I wouldn’t run tires above the sidewall pressure when cold. There just isn’t the return on investment if you will to justify the added risk. Pushing a car gets into the realm of being silly. There’s a time and place for these techniques. You can increase your mileage a TON by doing the coasting in neutral, but if you are in a safe place and can do the turning off the engine, you’re really save some money on gas. Finding the proper PSI for a car to not create undue wear takes a bit of time and a piece of chalk. Racers use this as a low tech way to figure out if they’re running the right pressure. Mark the tire with a line across the tread. Drive on flat ground for a hundred feet or so. Check the tire. If the line wears evenly – congrats – that’s the right presssure. If the mark is worn at the edges and not at the center – add air. If the mark is worn at the center and not the edges – remove a bit of air. Lots of people are not using the right pressure, and if you’re running different rims/tires than were on the car when you bought it – the manufacturer reccomendations for proper air pressure may not apply. And as many others have mentioned – too much air pressure changes the handling of the vehicle. And how many people are still riding well below the ideal pressure on their cars, much less the ‘maxium’. This hypermiling looks like obsessive-compulsive nonsense to me. Let’s not forget that drivers around me are anticipating my decisions and actions, and that they are expecting me to do something similar to everyone else. If I do something too bizarre (like refusing to accelerate, rolling through a stop sign, or other such “mileage maximizing behavior), and the soccer mom or dad in the 5700-pound SUV doesn’t accurately anticipate it, the results could be catastrophic. Then there is Road Rage from people who get annoyed at me for snarling up traffic with my antics. In some places, my life-expectancy might actually be reduced by this apparently-deliberately-annoying behavior. If one really wants to safe fuel, the bicycle may be the most economical vehicle there is. Please spend the extra time you have riding it, and not running me late for everything waiting for the inevitable ambulances to clear the road. I reached this blog after looking at a ‘hypermiling’ article on cnn.com, because I felt a desperate need to post an anguished “Are those people nuts?” I don’t want to be on the same road with people driving on grotesquely over-inflated tires, or coasting in neutral, or turning off their engines with the car in motion. Heavy traffic offers constant dangers and empty roads have this way of offering unexpected ones. No one should ever adopt driving procedures that reduce potential control of the vehicle. P.S. – I get a consistent 26+ mpg highway from a 6 cylinder Mustang, not the most fuel-efficient vehicle, simply by maintaining reasonable constant speed (highway 65-70), accelerating and braking as gradually as is reasonable, and otherwise behaving responsibly on the highway. That isn’t just enough; it’s best. Departing from the car manufacturer’s recommended tire pressure is a dubious tactic at best. One thing to keep in mind when you’re calculating costs is that you are using up your tires with every mile you drive, even though you don’t notice the cost of it until you get around to buying a new set. Depending on the vehicle and the tire, it’s like adding another 50 cents a gallon to your costs under a typical scenario. If you want to minimize tire costs, make sure you keep your pressure at an optimum level for your vehicle and driving conditions — this is seldom the maximum pressure on the tire’s sidewall, but probably fairly close to the manufaturer’s recommendation. An earlier commenter suggested using chalk marks to cover this. 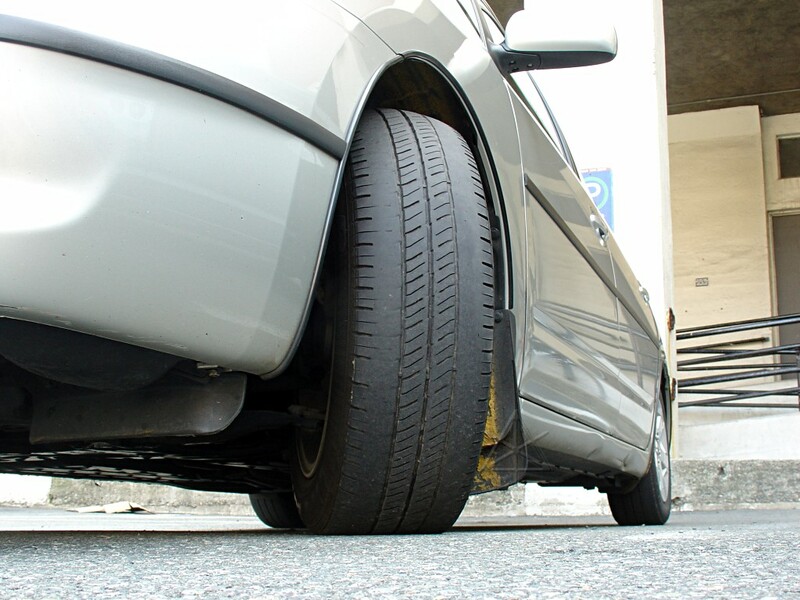 Add to this the practice of keeping your tires balanced, the alignment in good shape and regularlarly rotating your tires. These practices can easily add up to 20% to your tire life. I go into many of these things in more detail at http://www.tire-information-world.com/car-maintenance.html , if you’d care to know more. I love that nobody is taking into account vehicles that have no power steering, or cars with electric steering racks. I also love that people don’t seem to realize you usually have enough vacuum assist after shutting off an engine to provide you with two complete stops, and that’s using it in a wasteful manner (stored vacuum for safety, what a concept!). Also, as long as you are within the tire manufacturer’s maximum listed sidewall pressure, you’re perfectly safe in running it, provided the weather conditions are base clear, and provided you know how to handle your vehicle (common sense obviously). Modern tire construction makes it possible to run those pressures without much change in your contact patch size, though it will change your slip angles and roll rate. Neither are of much consequence to a skilled driver. You adapt to the car. The car is the tool, not the result. The problem with ANY engineer is that they are usually FAR from the front lines of the products they design. Even cars… Talk to any car mechanic, they’ll tell you engineers are smoking something. Quite often working on cars, the engineer’s lack of real world experience with their own designs becomes VERY apparent. The caveats are obviously well known, yes it is illegal to have your car in neutral (at least where I live), yes it leaves you with impaired response ability in a dangerous scenario, yes increased tire pressure changes the handling characteristics of your vehicle, yes your car will ride like a sled with the tire pressure so high, yes most drivers are so poor at driving normally that they are very poor candidates for using even “smooth” driving technique, let alone hypermilling. Yes we all speed, wasting gas yet continue to complain about the price, yes we buy non fuel efficient cars because they are what we want more then fuel efficient cars. Yes you will wear out your starter faster, or you won’t, depending on your aptitude with starting your car in motion (it can be an art). All of these variables can be altered, should someone wish to put forth the effort. Yes it is imperative that you get your car to operating temperature as fast as possible, not to mention before you start push starting it or starting it in motion. That isn’t an opinion, that’s fact. Yes, these techniques work best on manual transmission cars, without power steering (which as some people here will know, is a waste after 10mph, unless you drive some very heavy vehicle). Drove a ’64 Lincoln Continental once with the P/S system not functional… now that was an adventure. The bottom line is, it is each of us our own choice what we want to do about driving and fuel economy. Attacking each other is pointless. Do what you feel you can or should, and live with the consequences, good or bad. I will do the same.